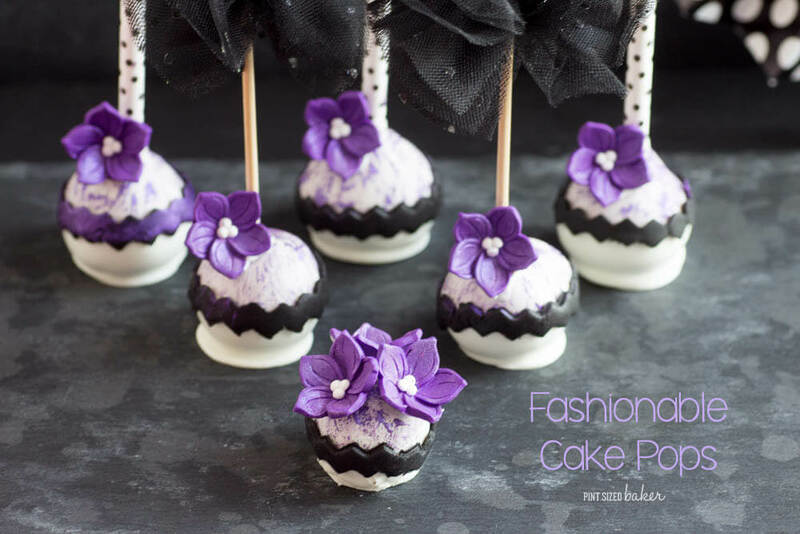 Learn how to make these Purple Fashion Cake Pops inspired by Kate Spade and Vera Bradley. 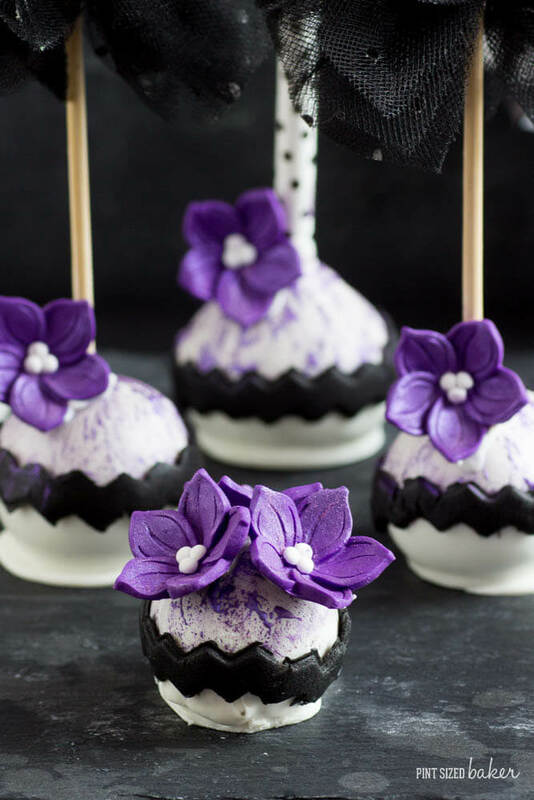 They are sure to be stunning on your dessert table! I love finding cute Wilton products when I’m not looking for them. 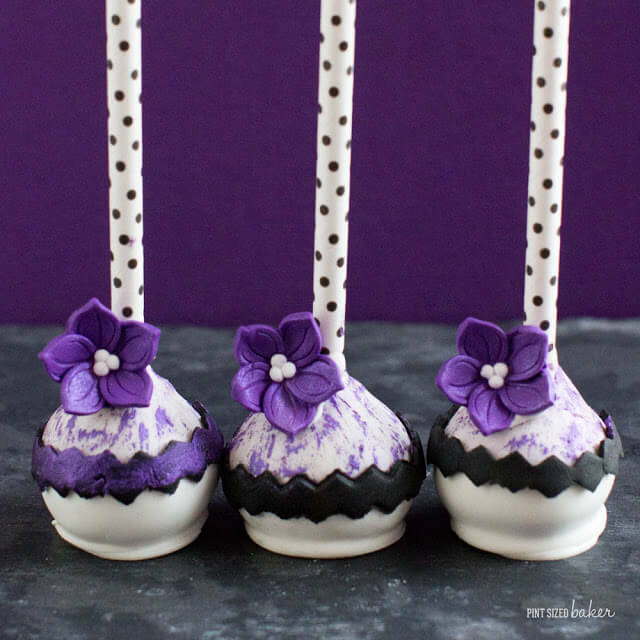 I found these cute purple posies and saved them for a special occasion. My guess is that they were at Wal-Mart in their Wilton area. I just love finding new products there. Have you seen the little packages of fondant as well? I picked up a small black fondant pack to use to wrap around these pops. 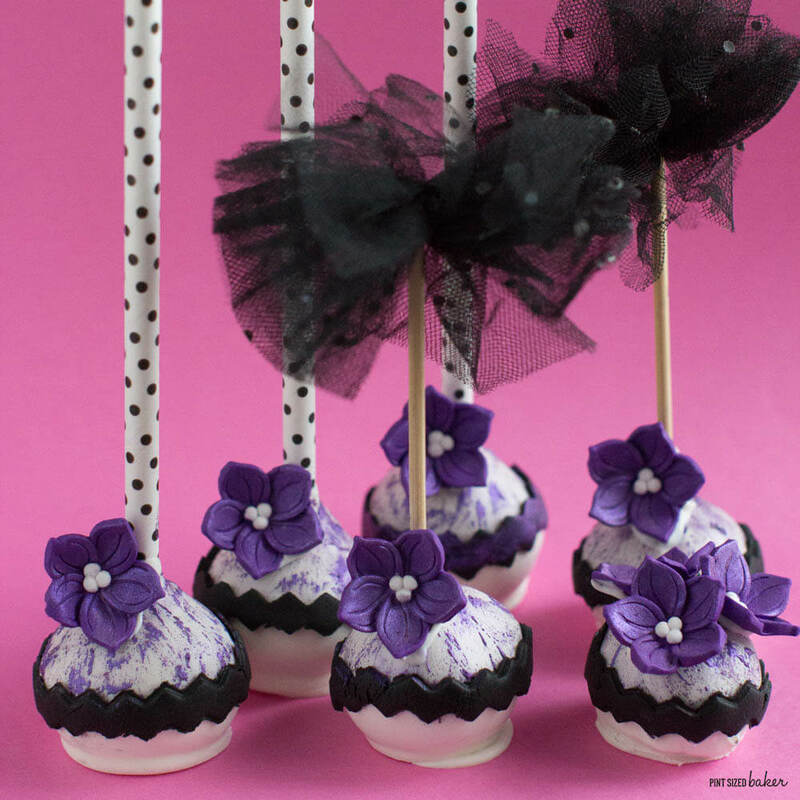 I thought the black fondant stripe with the purple flower looked like a high fashion cake pop! Something for a Kate Spade, Tory Birch, or Vera Bradley collector! I made these for one of my dearest friends. She just turned 40 and I am off to celebrate her birthday with her in Michigan. I hope that she loves these as much as I do! I used some Wilton polka-dot straws and some cupcake topper pom-poms I found at Hobby Lobby. I wasn’t sure if the pom-poms would be too much or make them stunning. I think I chose wisely. Thankfully, I was able to make these ten pops in under 2 hours. I was on a tight schedule to get these done, photographed, and posted – plus laundry, packing, and getting my kid from school, then driving to grandma’s house. So, to get these done in a jiffy, here’s what you’re gonna do – use 1/4 of a 9×13 cake with 2 tablespoons of canned frosting. 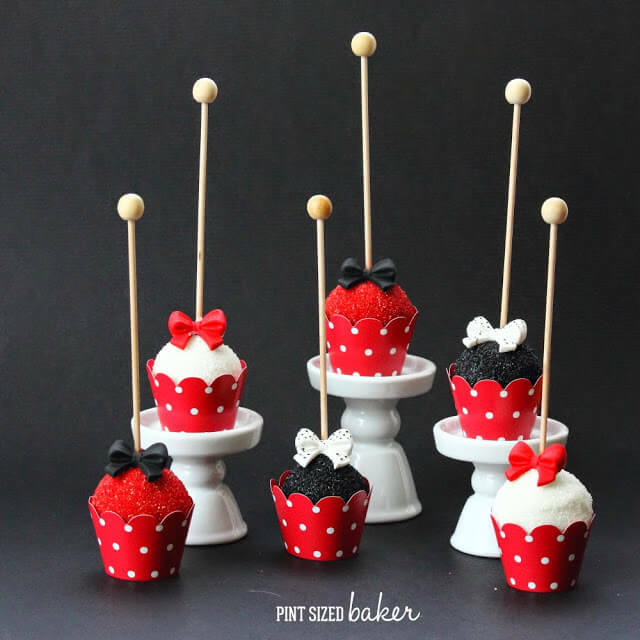 Mix those in a stand mixer and then make cake balls using a 1 Tbsp cookie scoop. Roll them smooth then place them in the fridge while you melt a bag of bright white candy melts. 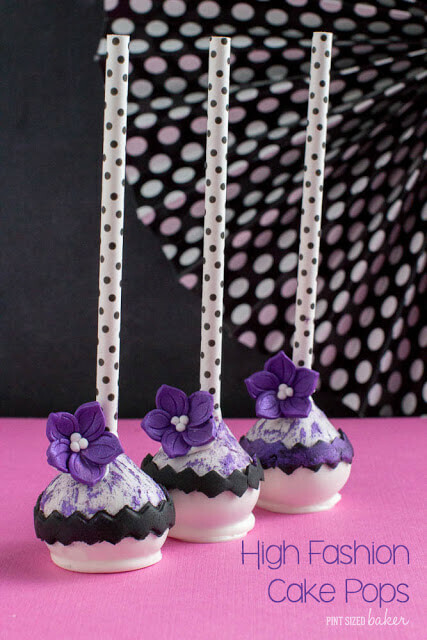 Dip the straw/ lollipop stick/ handle of choice into the melted candy then insert it into the cake ball. When they are set, dip the pop straight down, then tapped off the excess and stand them up to dry. 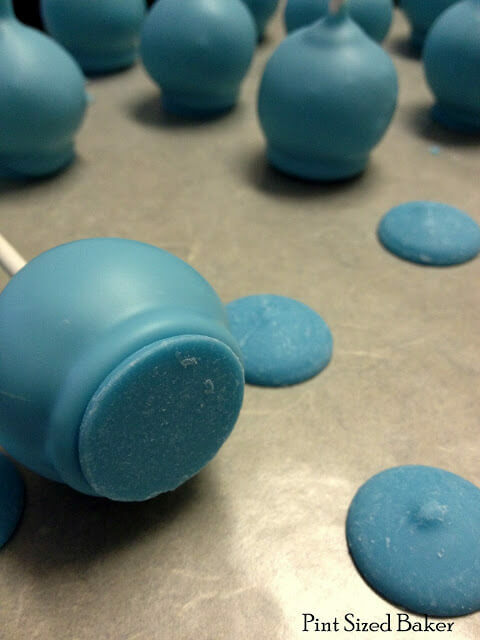 Here’s a great tutorial on how to get perfect bottom cake pops every time. When you’re done dipping make the fondant wraps. Roll out the fondant very smooth and thin, then use a Wilton Fondant Ribbon Cutter to cut the design. Gently, carefully pull the strips apart and set them aside, under plastic wrap so that they don’t dry out. In a little bowl, add some purple pearl dust and a drop of vanilla extract then mix it together and “paint” the purple on the top half of the pop. I love how it turned out! Kinda a mix between a watercolor and a brush embroidery technique. 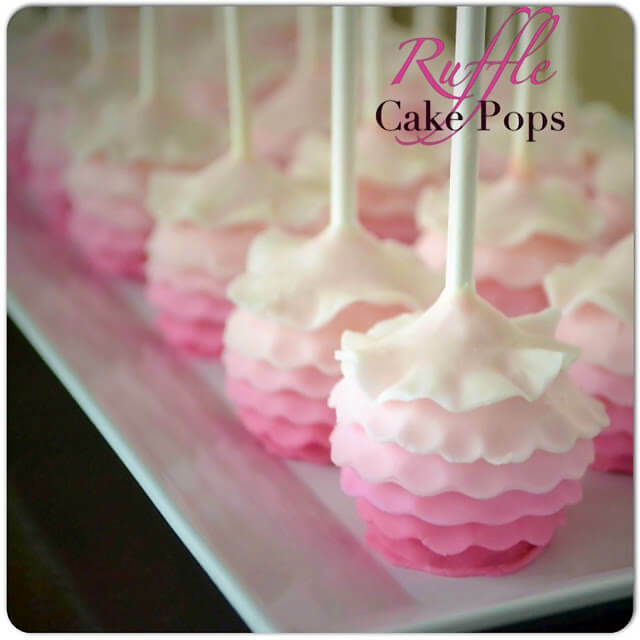 Paint some vanilla on to the back of a fondant strip and attach the strip to the cake pop. Push a little to make sure that it adheres to the pop. Then add a bit of wet candy to the back of a flower and attach it. See? Easy Peasy!And I think they turned out GREAT! I hope that I get a few hours of sleep tonight before I have to get on a plane at 7 am tomorrow. It’ll totally be worth it to hang out with my girlfriend on Lake Michigan and enjoy some Sangria! *Disclaimer – I am a member of the Wilton Sweet Team and am a paid ambassador for them.